Let’s face it. There are so many great things about summer: warm weather, longer days, and lots of fresh produce. For me, it’s easy to create a colorful salad masterpiece with in-season vegetables and fruit during the summertime. Bright red tomatoes against a green leafy background topped with fresh blueberries makes getting an extra serving of vegetables and fruit a breeze. Salads aren’t usually the first thing I choose during the winter because my favorite salads involve summertime produce. Since eating a balanced diet with plenty of fruits and vegetables is important all year long, I started looking into what produce is in season during the winter months. To my surprise, there are plenty of in-season complementary fruit and vegetables that make great additions to any salad. Step One: Start with a base. Kale is an excellent winter salad base because it’s in season. Other options could include shredded Brussels sprout or spinach. Step Two: Add complementary winter vegetables such as roasted butternut squash, sweet potatoes, radishes, or onions. Step Three: Toss in some healthy fats and protein. My personal favorites are sliced almonds or walnut pieces. Roasted chickpeas can add a tasty crunch. Opt for classic shredded chicken or hard-boiled eggs for protein. Step Four: Toppings! This is my favorite part because there are endless options. Citrus fruit and pomegranate seeds add a sweeter twist. Feta cheese, olives, and fresh herbs can elevate a salad to the next level. Step Five: Finally, the dressing. Opt for an oil based dressing with no added sugar. You can even make your own with minimal effort (see recipe below). As you can see, there are so many ways to create a delicious and filling salad during the winter months. 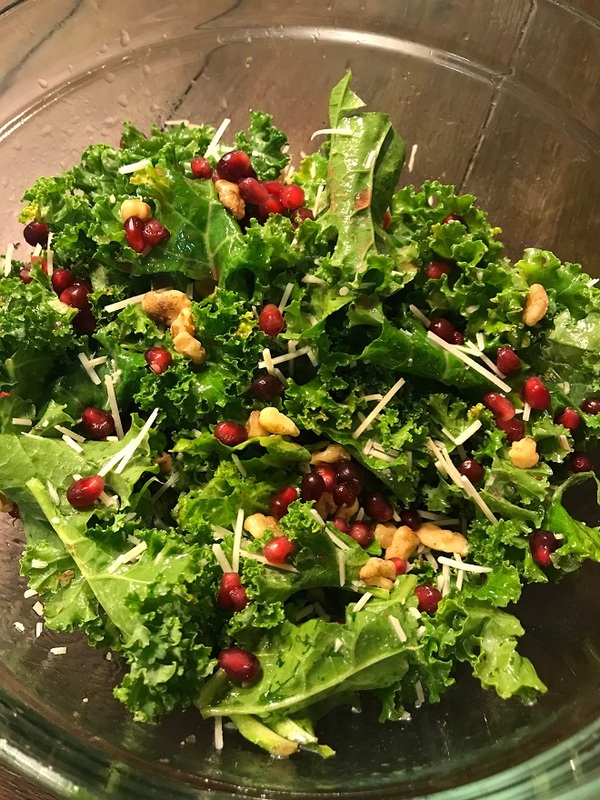 I tried this simple kale salad for a family dinner and everyone gave it a thumbs up! Place washed and stemmed kale in a large bowl. In a small bowl, whisk together the olive oil, vinegar, mustard, honey, salt, and pepper. Pour dressing over kale and toss to coat. Sprinkle the pomegranate seeds, walnuts, and cheese over the salad.